This half-term, we have been developing our core-skills (Listening, speaking, gross motor, fine motor) in Nursery and enjoyed launching our ‘Living Books’ project. We have enjoyed a range of activities that develop our core skills based around topics that we have discovered from reading lots of fantastic story books. By making links between our learning and the stories we read it helps us develop a love of reading which can last a whole lifetime! We kicked off our project by having a wonderful ‘Story Party’! A special storyteller came into school and we explored two exciting books about owls with our families and friends. We were singing, dancing, building nests, making owl calls and lots of other interesting things linked to the stories. It made us realise how many fun things that books can inspire us to explore. We have enjoyed stories about brave owls, piano playing gorillas, snuggly mice, screeching parrots and even hairy toes! Through these stories we have been inspired to explore puppet shows, dance like animals, create colourful ice collages, and draw dreamy chalk nightscapes and much more. These activities are helping us to build our understanding of reading, writing, counting and our physical confidence in using tools and equipment. Finally, we have enjoyed exploring Christmas in Nursery by creating cards, wrapping presents and creating wonderful decorations for our homework. Our tree looked fantastic! We have also been working hard to practise for our Christmas Play, ‘The Christmas Star’. By practising our singing and dancing each day we learned lots of wonderful songs and we really impressed our families by how brave and confident we were during our live performance. 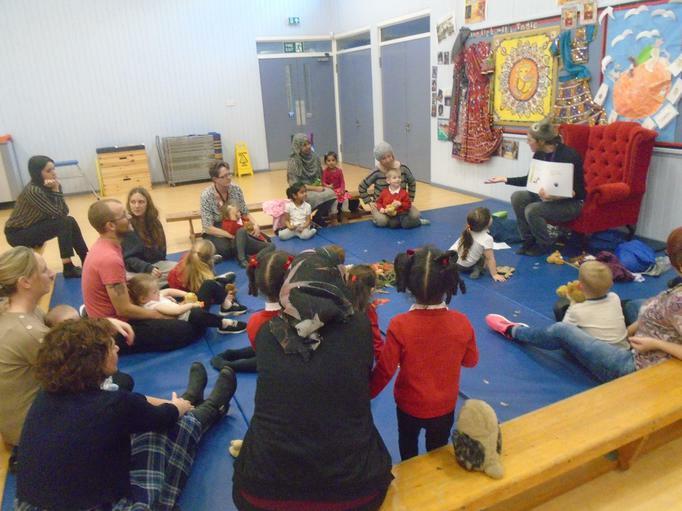 ‘Owl babies’ showed us that it is important to be brave and have a go at learning new skills. We learnt the importance of being kind to others and how to be a good friend in ‘Mr. Big’. We enjoyed developing our speaking, listening and phonic skills by being noisy parrots like the characters in ‘Harold Finds a Voice’. 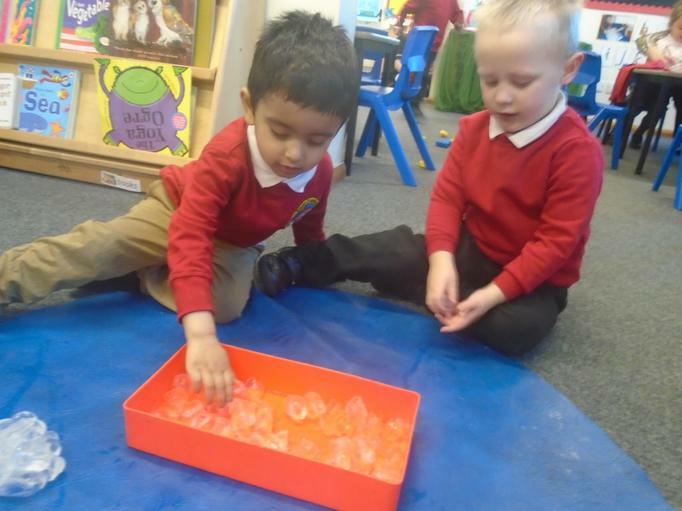 The story ‘Immi’ taught us that water freezes when it is cold and that ice melts when it gets warm. 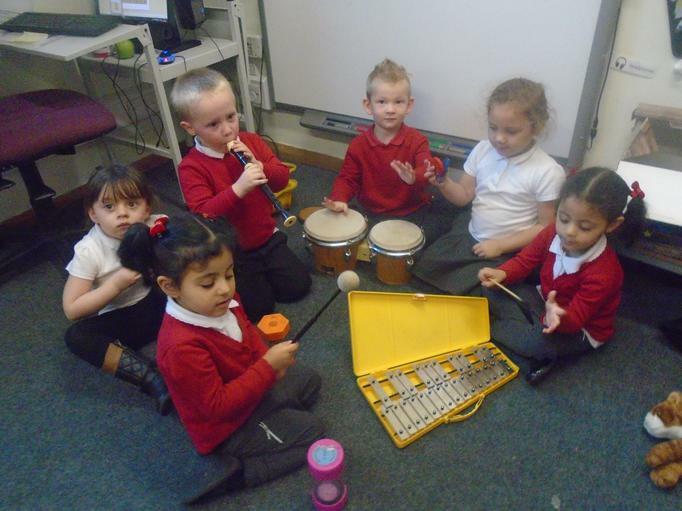 We developed our understanding of musical instruments, rhythm and beat through the ‘Tanka Tanka Skunk’ story. What is your favourite story at home? Can you tell that story with your family? Can you act out / draw a picture / sing a song about that story? Could you come into Nursery and share it with your friends?